I made a promise last week to Dr. Suwaree, wife of former MP for Phitsanulok Dr. Warong, that my family will attend the cremation ceremony of her mother. If you’ve been to a Thai funeral (I’m assuming in other countries as well), you will see people wearing either black or white or a combination of the two. You can also get away with muted colors like blue jeans but with a black or white polo shirt. Brights ones are a no-no as they mean disrespect especially to the family of the deceased. There were so many people when we arrived, mostly politicians in their tailored coats and ties. 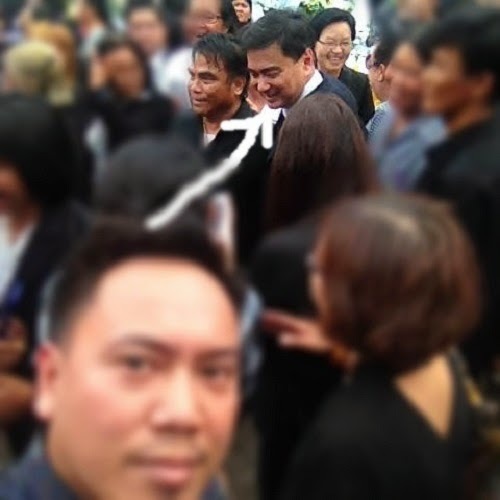 I saw Democrat Party leader and former Prime Minister Abhisit Vejjajiva and some other prominent figures in their party; people that I saw several times on TV during the PDRC’s march in Bangkok in summer this year. They went dark with each other for the time being as the monks recited their chants. Their silence helped me in taking the liberty to observe a typical Thai funeral. I am certain there were things I failed to see; things that transpired before our arrival. However, let me tell you what I observed. We were positioned a little behind the crematorium so there was no clear view of what’s going on. Added to the bummer was the pillar that literally blocked us to see whether people approaching the coffin were doing something, like paying respect or offering something. Meanwhile, a lady carrying a basket approached us and offered what appears to be flowers made from wood shavings. We didn’t know what to do so we simply smiled back and let her pass so she could offer them to those behind us. When the chants were done, the guests were on their feet moving toward the coffin. We immediately seized the opportunity and moved ourselves facing the crematorium to get a good view. The coffin was placed on a high table in front of the crematorium doors with a huge portrait of the deceased placed next to it. The crematorium was adorned with black and white cloth. There were also flowers on both sides of the stairs and on the walls leading to the coffin. Those flowers were the favorites of the deceased, at least that’s what my nurse friend who was there told me. 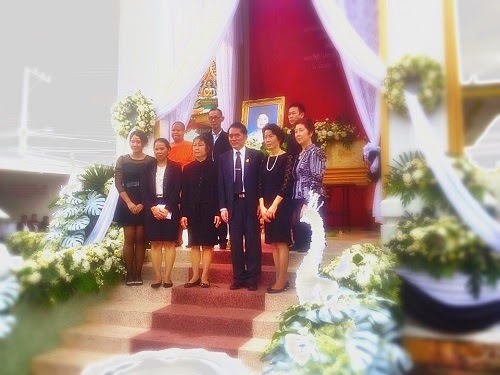 As I was observing the surrounding, I didn’t notice that people were already having pictures with Dr. Warong’s family. I grabbed my phone from my pocket and took a photo of them (the first one on top). 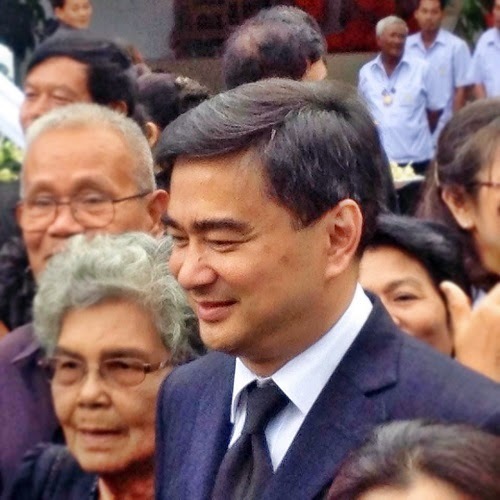 Then I saw Abhisit nearby. He was technically within reach. As much as I would like to have a picture with him though, there were just too many people surrounding him. I decided to take a selfie instead. I’ll make it to a point to offer a handshake come the time I see him again. Meanwhile, other prominent politicians including the governor of Phitsanulok were also being asked by the locals for pictures. When things settled down for a bit, I approached Dr. Warong and Dr. Suwaree and offered them our condolences. They thanked us for coming and pinched my daughter’s cheek lightly before leaving.